Looking to add a tropical look to your bedroom. Then the Croscill Brazil Sheet Set will have you imaging that you can hear the call of the Toucan in the treetops. This attractive set from Croscill depicts the beauty of the Brazilian tropics. The flat sheet is tan with tone on tone print and features a 5 inch printed band of palm leaves and hibiscus flowers on a chocolate background. 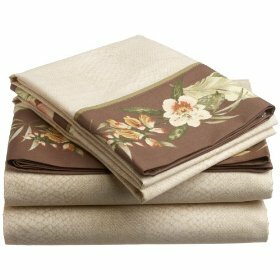 The fabric is soft 300 thread count, 100% cotton sateen. The fitted sheet deep corners and elastic on all sides which gives you a secure fit on mattresses up to 18 inches in thickness. 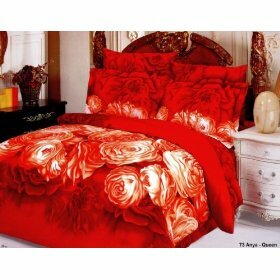 The sheet set is available in King, Queen and Cal King sizes. 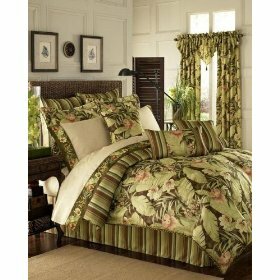 The Croscill Brazil Comforter Set is also available in King, Cal King and Queen sizes and all feature a tropical floral design on the face and on the reverse is a printed stripe in coordinating colors. The comforters are overstuffed and have a 3/8″ trimming in a multi color twisted cord. The set comes with a tailored bed skirt in the same coordinating vertical stripe as shown on the reverse of the comforter. The cotton/polyester bed skirt has an 18″ drop and has split corners. Each set includes 2 standard pillow shams featuring the same tropical floral as the front of the comforter, on one side, and the coordinating stripe on the reverse. They also feacture a 2 inch flange and a 3/8 inch multi color twist cord on the edge of the sham. There is a 4 button closure on the pillow shams. The comforter sets are made of polyester and polyester/cotton blend and it is recommended that to keep your set in tip top condition that you only have it dry cleaned. And why not complete the look with beautiful coordinating designer pillows. may be the perfect thing to give you the night’s sleep you have been hoping for. Constructed of supple satin this set of pillow cases will fit on your regular pillows to make them go from normal, scratchy and uncomfortable pillows to soft and satiny places to lay your head. All the details were thought of when it came to these pillows, as they were not only made of soft satin, but also they have a zipper to keep them on your pillows. If you have used satin before you know how important it is to make sure you have a satin pillow that will not slide off during the night. Additionally, the attention to detail continues with the zipper being a hidden zipper. By being hidden within the material the zipper will not end up grabbing a hold of your hair and pulling it out. It is a good price for two satin pillowcases. They work to keep your hair from snagging on cotton weaves. 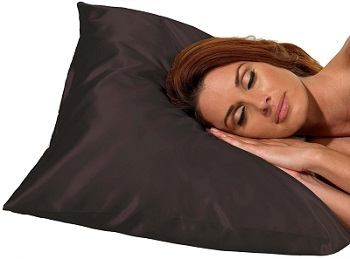 They’re easy to put on your pillow and the zipper keeps them in place. The zipper is hidden so it does not end up pulling your hair. These are a little baggy on standard pillows and a bit too snug for California king pillows. Not high end satin but they are good value for the price. It’s like a dream come true! A Bed in a Bag set provides you with nearly all of the bedding you need to decorate your bedroom. Since it all comes in one neat pre-made bundle, you don’t even have to hunt and compare items to be sure it all matches. Each ensemble has in its own bag of matching fabric. Most sets come in king, queen / full or twin sizes and usually include a comforter, two pillow shams, a bed skirt, and two decorative pillows. Some sets don’t include the decorative pillows, but you can always add them yourself later if you so decide. If you want your bedroom makeover to take on a professional look, there are usually matching or coordinating window treatments from which to choose. You may also want to consider a soft subtle colored throw rug and several paintings that are mellow in design, as accent pieces, to complete your desired look. Adding a featherbed and pillows made from an incredibly soft, hypoallergenic down alternative material is certainly something to consider, also. This will create a sleeping environment that is big on comfort as well as practicality. These additions plus your Bed in a Bag bedding ensemble will create a beautiful and trendy master bedroom. Finishing off your bedroom makeover with super soft cotton sheets and pillowcases will put you in line for many nights of relaxing comfort. Sound sleep and the beauty of your new Bed in a Bag bedroom will make you never again want to leave the comfort of your room. 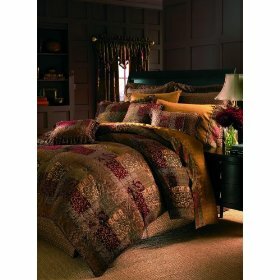 The Croscill Galleria Comforter Set is a beautiful bedding set of luxurious colors, trims. The Front of the Comforter features a patchwork pattern with damask, paisley, and a lattice motif, in rich tones of red, bronze, and gold.The reverse of the comforter is a solid taupe color. The Galleria comforter is overstuffed which stops it from sagging at the corners, and it has a 3/8″ multi colored twisted cord around the edges. The set is available in King, Queen and Cal. King sizes. King: 110″ in width x 96 ” in length. The Bed skirt has split corners which allows your to use with footboards. The pillow shams have a solid taupe color on the reverse side and a French back opening which lets you easily insert the pillow. It is recommended that this set be Dry cleaned only. Do you have a teenager? How about a preteen that is about to become a teenager? This is a point in their life when they will want you to make some changes to their living space. Teens are just starting to get more and more of their individuality and personality. This means they are going to want to express it in their bedrooms. This is also a time when a child is growing bigger and towards adulthood so many of those children’s furniture pieces they have are no longer fitting them. So, how do you furnish a teen’s bedroom? Talk to your Teen or tween – First and foremost you want to talk to the teen to make sure you know what they want. Your teen will definitely have their opinion about what is best to decorate their room with. While you may not agree with all the things they say, try to listen and see the kinds of things they like. Meet in the Middle – Once you have talked to your teen, see if you can find some common ground to start furnishing their room. While you may not like all of their decorating ideas, remember, they are trying to flex their wings of individuality. If you can, let them do that, within reason, by trying to use as many of their decorating ideas as you are comfortable with. Think of the Future – A final consideration is to think about the future of your teen. After high school is your teen going to go to college? They will need furniture when they move away to the dorms. If you are smart you will take the time now to choose furniture pieces for their room that will hold up over time and also be the furniture they take when them when they move out. And don’t forget to check out our website for teen bedding options to complete the look of their bedroom.